Without committing an overshare, I’ll say that I’ve been craving junk food this week–specifically chocolate. I dove into a massive piece of chocolate cake with chocolate fudge (and fudge wasn’t just the name…it really was fudge) frosting and some kind of chocolate buttercream filling yesterday and today. It was only a buck at the bakery at Vons and it. had. to. be. mine. In fact, writing about it right now has my buds watering. I can imagine tiny arms emerging from them with grabby hands “cake, cake, mine, mine!” Which is funny because growing up, I never really fancied cake. I would ask for a massive chocolate chip cookie for my birthday from The Great American Cookie Co. I’ve since learned to love the fluffy, moist and decadent dessert, but I might resort back to my cookie days this year for my birthday (of course, it’ll be a DIY cookie). 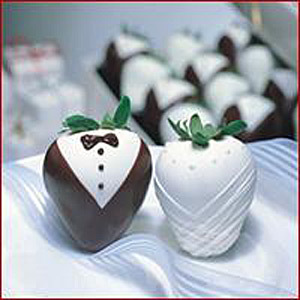 Anyway, while visions of chocolate are dancing in my head, I’m going to make chocolate covered strawberries this week. They’re stupidly simple (I write as I jinx myself for my next kitchen venture) and so fun to give away on Valentine’s Day–only 3 weeks away people! I’ve done them in the past–simple ones with white or milk chocolate, maybe a drizzle of the opposite chocolate on some of them. 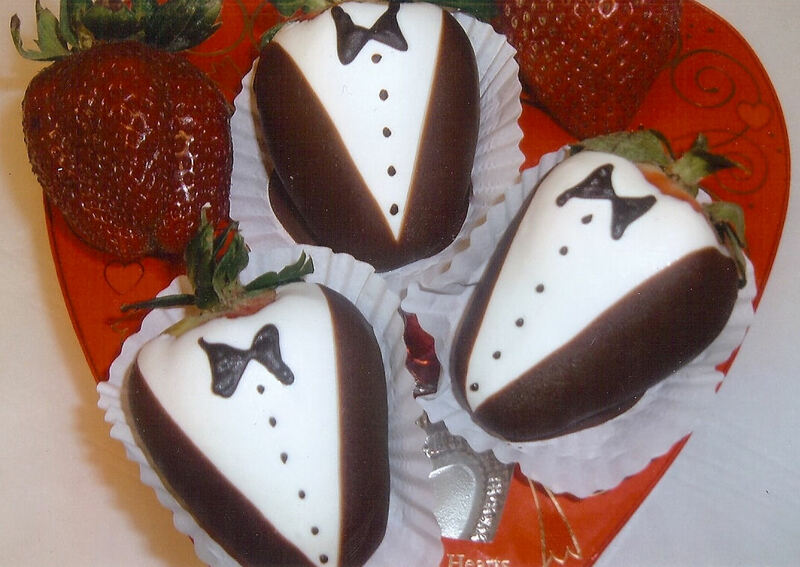 This year, I’m going to try to do the cutesy tux ones they sell on Feb. 14 and I’ll use fresh strawberries from the Coronado farmers market! My college dormmate, Katie, gave me one for my 19th birthday and I thought it was so sweet. They really are a good gift for acquaintances, co-workers, family of spouses, etc. I even saw a cake recently when I went cake tasting with my bff Pam that had two chocolate-covered strawberries on top that was a groom and bride! So cute! I can’t guarantee mine will look anything like this, but I will have fun with them. I’ll give you some good ideas of what to dip them in, how to properly melt the chocolate, etc. I can’t wait to see my parents’ reaction when they see their kitchen turned upside down as I make my chocoholic dreams come true! Anyone else excited for Valentine’s Day and all the goodies that come with it? ?